A ZIP archive extraction directory traversal vulnerability has been found in ES File Explorer. When exploited, this vulnerability allows an anonymous attacker to write files to arbitrary locations within the SD card of the user's Android device. This advisory discloses a ZIP archive extaction directory traversal vulnerability in ES File Explorer. When exploited, this vulnerability allows an anonymous attacker to write files to arbitrary locations within the SD card of the user's Android device. When extacting compressed files from a ZIP archive, the ZIP extraction functionality does not properly sanitise compressed files that have directory traversal sequences in their filenames. 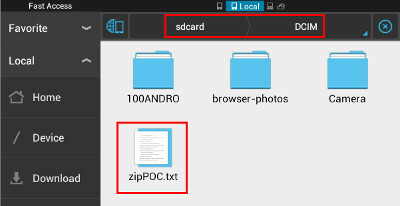 By tricking a user to extract a specially crafted ZIP archive containing files with directory traversal sequences in their filenames, an attacker can write files to arbitrary locations within the SD card of the user's Android device, possibly overwriting the user's existing files. 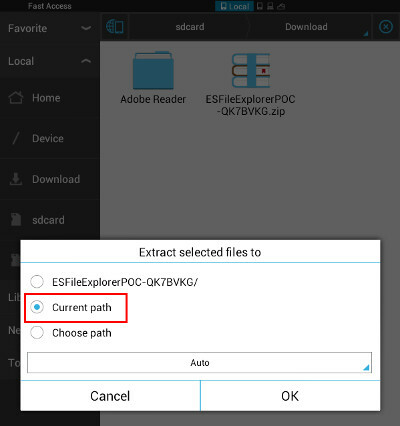 When the user views a compressed file within a ZIP archive, the ES ZIP Viewer functionality in ES File Explorer will extract the compressed file into the /sdcard/Android/data/com.estrongs.android.pop/tmp/zip temporary directory. ES ZIP Viewer does not properly sanitise compressed files that have directory traversal sequences in their filenames. By tricking a user to view a compressed file with directory traversal sequences in its filename, an attacker can potentially overwrite known files within the SD card of the user's Android device. This causes it to be written into /mnt/sdcard/DCIM/zipPOC.txt. Extract the POC ZIP archive into the Current path. Delete the zipPOC.txt file that appears in the /mnt/sdcard/DCIM/ directory. 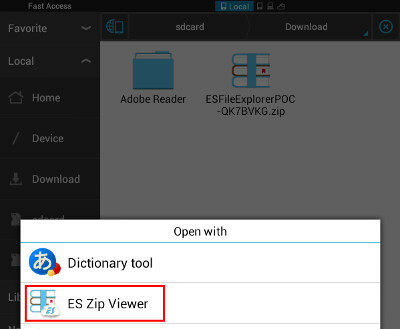 Navigate back to the Download directory and open the POC ZIP archive using the ES ZIP Viewer. With the POC ZIP archive open in the ES ZIP Viewer, navigate all the way into the POC ZIP archive until you see the zipPOC.txt file. Open the zipPOC.txt file using ES Note Editor. Now, navigate back to navigate to the /mnt/sdcard/DCIM/ directory. You'll notice that zipPOC.txt has been extracted into /mnt/sdcard/DCIM/zipPOC.txt, instead of into the temporary directory. Avoid extacting untrusted ZIP archives. Update to version 3.0.4 via Play Store when released. 2013-05-20 - Initial Vendor Notification. 2013-05-21 - Vulnerability Details Sent to Vendor. 2013-05-23 - Asked Vendor for Release Date of Fixed Version (no reply). 2013-05-28 - Asked Vendor for Release Date of Fixed Version (no reply). 2013-05-28 - Vendor replied that vulnerability will be fixed in version 3.0.4.